The Meaning Of Wearing a Red Thread Tied To The Wrist - ShareIt! Did you ever pay attention that a lot of people wear a red thread on their wrists? Surely you have noticed and may even use it. However, not everyone knows its true meaning. The first thing to know is that the red thread has been used as an amulet since the times of antiquity. Thus, its main function is related to the attraction of positive energies for those who carry those threads on their wrists. But in addition, wearing this amulet has a lot of different meanings that most people do not know. For this reason, in this article we want to talk about the true meaning of wearing a red thread on the wrist. Read on to learn all about it. It is never too much knowledge! The meaning of wearing a red thread tied to the wrist. The red ribbons have been used since antiquity as an amulet. Because its use has been prolonged for so long, a great number of meanings have been derived. One of the most widespread versions is Kabbalism according to which wearing a red ribbon tied to the left wrist serves to ward off bad energies. This is because the cabal maintains that negative energies circulate in the left hand. That is the meaning given to it by the Kabbalists and they use it for that purpose. Other traditions use it to ensure the prosperity and well-being of those who carry it. But the red threads can also serve to protect rituals. 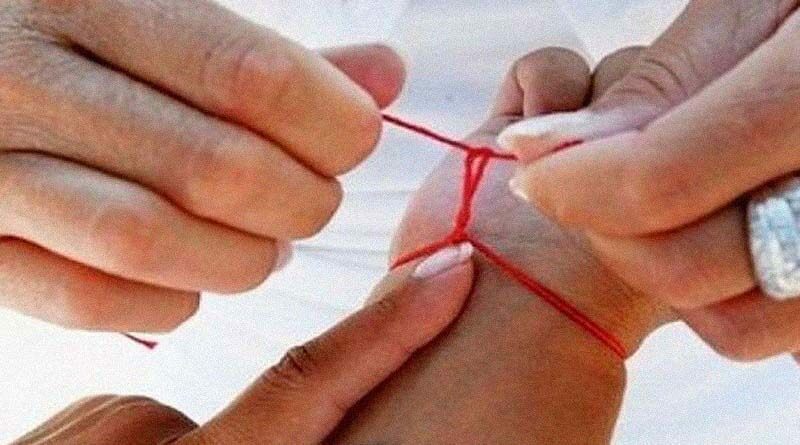 You only have to make sure that the red thread is made of natural wool and that the one who ties it to your wrist does it with good intentions. Thus, there are several issues that need to be considered before tying it. Next we will give you the keys so that you learn to knot it correctly to attract good energies. How to tie the red thread to the wrist? When it is cut, do not worry because it is a good sign. Its rupture means that it has attracted all the negative energy it has been able to and that it no longer gives. That is why it means that you have taken care of for a long time or very aggressive energies. You can also vary the color of the thread to attract different things to your life. These are some of the most used colors and their true meanings. –Orange: it serves to favor the healthy ambitions, the nobility, the purity and the harmony. –Rosa: guarantees true and passionate love for a long time. –Violet: serves to stimulate creativity and stimulates the imagination. –Black: contrary to what can be supposed, this color attracts stability and tranquility. –White: it helps you to become wiser and to be a sincere person. –Yellow: it is beneficial to stimulate success in people with creative gifts. ← Look at This Picture and Decide Who Is the Most Stupid: Your Choice Can Reveal Something about Your Personality!